Last year Susan was approached by video producer ASF to become involved as a contributor providing a visual lesson with demonstrations on pyrography. 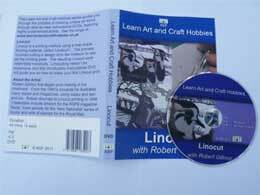 This was to be one of a range of various instructional DVDs in the Learn Art and Craft Hobbies series. Each title in the range guides individuals wishing to learn a new hobby through the process of creating unique art forms. Filming subsequently took place and "Pyrography with Susan Robey" is the third title in the range. The DVD covers tips and techniques for working on wood and leather. Easy projects on both these surfaces are included, guiding the beginner through the entire process of creating their first pyrography items. Presented in the style of an easy step-by-step tutorial with intuitive and descriptive chapters, any of which can be re-visited, all actions are clearly demonstrated in a professional DVD. The other two titles also available in the range so far are "Linocut with Robert Gillmor", the internationally acclaimed wildlife artist, and "Stained Glass with Caroline Loveys", a well established artist and teacher of stained glass to the beginner and more experienced. The next two DVDs soon to be released will be on Collograph printmaking and Mosaic. 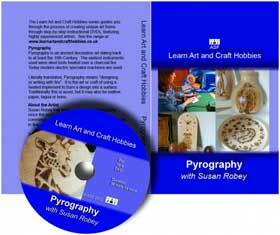 The "Learn Art and Craft Hobbies - Pyrography with Susan Robey" DVD has now been released and is available to purchase as from Monday 16th April 2012. For more information, including how to place an order, on this and others in the range please visit www.learnartandcrafthobbies.co.uk .